Editor’s note: Given the ongoing need for brands to use social media strategically, we are sharing this article updated from its original publication last year. Concerned about how Facebook’s latest algorithm updates might affect your brand’s performance on the platform? Questioning where your Facebook ads might appear across its network of sites, including on Instagram and Messenger? Curious as to whether user trust has deteriorated to the point where social media is no longer a safe space for your brand to play at all? You’re not alone. Brands typically have a lot of questions when it comes to marketing to consumers on any third-party content platform. Social media can be particularly puzzling as the rules, opportunities, audiences, and value propositions vary greatly from one channel to another – and can shift gears abruptly without a moment’s notice. But one thing that can make your decisions more straightforward is establishing a channel plan – an advanced directive for how your brand can and should distribute its content marketing efforts on rented channels like social media, and what you expect to achieve. Many brands mistakenly assume they need to post their content anywhere and everywhere to maximize its potential reach. But plastering your brand’s content across every social network, trendy news site, and video platform that comes along is not a channel plan. That social media approach attempts to go as far and wide as possible, but it holds no regard for whom it reaches, how they might be impacted, or how that impact might reflect on the business. Remember: Your content marketing strategy should define your social media marketing strategy – not the other way around – because it’s always best to evaluate each social channel against your strategic goals and audience needs before you distribute content there. And when you turn this evaluation into an actionable plan, everybody on your team will know where, when, and what they should be posting on each channel, as well as what their efforts are meant to achieve. Here’s how to create and implement a channel plan for social media marketing that will enable you to do just that. The nature of each channel and the engagement preferences of its core community will play a major role in deciding whether your content is a good fit. For example, your audience might be open to connecting with your brand in a Twitter chat but prefers to reserve Snapchat for conversations with personal friends. Long-form content might play well on LinkedIn or Medium, while memes and captioned photos on these platforms would be inappropriate. It’s important to familiarize yourself with the characteristics of each channel and its corresponding community before joining the conversation. With a short list of potential channels in hand, map your existing content assets to the most appropriate channels for their distribution. Who uses this channel and what are they using it for? Is it an important channel for our personas? What are conversations like here? Will it help us meet our objectives? Why does it make sense for our business to use this channel? What goals will we pursue through our actions here? Does it fit in with our editorial mission? Will our content be viewed as unique and valuable or will the community find it intrusive or irrelevant? Have our competitors established a strong presence or is there a chance to lead the conversation? What results do we want to achieve? What should we be asking fans and followers to do after engaging with our content? Share it? Comment? Visit our site? Subscribe to our newsletter? Is this an action this community is likely to take? What kinds of content will work best on this platform? Are our topics relevant to this audience? Have we created enough content in the appropriate formats to communicate consistently? What’s the right tone and voice for this platform? Would a friendly, fun approach work best or will the audience expect a more serious, professional demeanor? Does the conversation style match our brand’s voice and values? What’s the ideal posting frequency? Should we publish once a week? Multiple times a day? What days and times of day work best? Do we have the ability to sustain our efforts over the long term? If your responses don’t reveal a compelling opportunity to engage on that channel or if the platform’s environment isn’t well-suited to your brand’s content vision and mission, it may be best to step away and reserve your team’s resources for channels that are a better fit. The primary purpose of content distribution is to build a trusted connection with your audience. While your company’s goals are important, you also need to find the right tone, relevant talking points, and a compelling point of view to engage your target consumers in what you have to say. Are there industry events, media innovations, or consumer behaviors on which your content distribution can capitalize (e.g., livestreaming video consumption habits, device-specific capabilities like memojis, popular memes that are capturing attention)? How might these impact the tone/velocity you should adopt for distribution? Are there controversies or algorithm shifts that might be cause to reconsider their value to your brand? As trending topics come into the spotlight, they can present timely distribution opportunities. For example, culture-related topics – like diversity, race, and gender equality – are at the forefront of the U.S. media right now. Brands using their content as a podium (like Belvedere Vodka has done with its A Beautiful Future digital series, in partnership with Janelle Monáe) can earn a critical boost in visibility and relevance in social media conversations they normally wouldn’t pursue. If you only have an editor or two managing the content marketing process, the bandwidth for consistent distribution and conversation monitoring may be limited to a few outlets; however, if you have a full team of writers, editors, and other distribution partners at your disposal, the extra manpower (or womanpower, see above) affords increased flexibility and control to manage content across many more channels. Now that you have the information to determine where, when, and how to distribute your content, building the plan is simple. Create a matrix of the channels that make the most sense for your brand and make a note of all the specifics of engagement your team should follow for each one. When all the fields are filled out, you have a template that can be referenced easily, updated as necessary, and shared throughout your organization. In my experience, it can be useful to outline as much information as possible in your initial plan, so your team can refer to it when new opportunities emerge and decisions need to be made. But it’s perfectly OK to start simple then build on/refine your data fields as you learn what’s working and what isn’t. Editor’s note: While CMI was used as a reference for this template, the sample data shown here does not represent our channel plan. No matter how far and wide your business intends to extend its reach, successful content marketing distribution often comes down to having a strategic, systematic, and scalable approach. Our model is one way to ensure that everyone involved with your content is working from the same blueprint, but it’s not the only way to get the job done. Let us know what processes you use to determine where, when, and how you share your content and spread your brand influence. Social media was a hot topic at Content Marketing World 2018. Weren’t able to attend or missed a few sessions? Watch it from the comfort of your office through the video-on-demand option. Subscribe today. 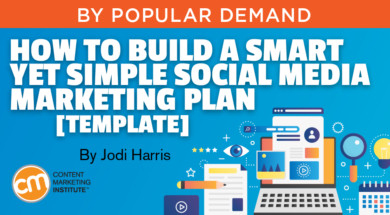 The post How to Build a Smart Yet Simple Social Media Marketing Plan [Template] appeared first on Content Marketing Institute.